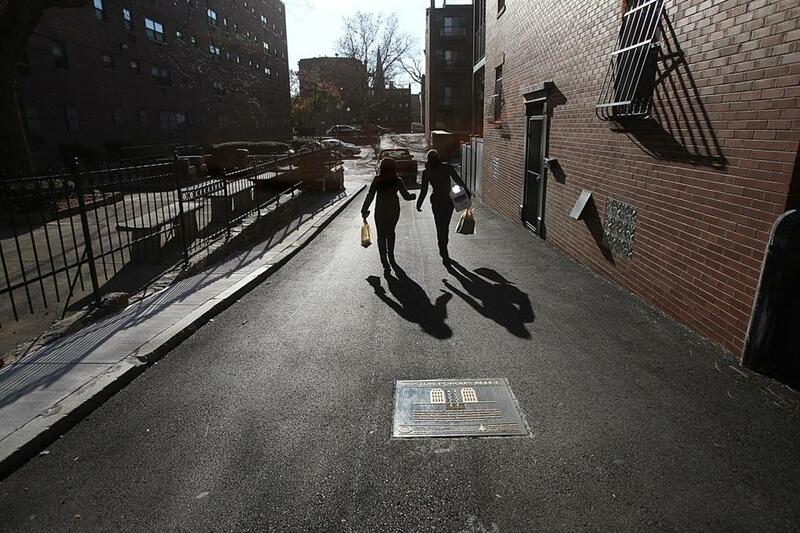 The “porous alley” between West Canton Street and Holyoke Street in Boston’s South End helps absorb rainwater and filters it back into the ground. The average city street collects a lot of pollutants over time: Dog poop. Leaked oil. Leaves. When a storm hits, the microorganisms, phosphorus, and heavy metals from such debris make their way into the sewer system and often into the overflow that enters the Charles River. City officials are hoping a solution to that problem lies in a small alleyway between West Canton and Holyoke streets in Boston’s South End. Mayor Martin J. Walsh on Friday afternoon announced the completion of a new “porous alley” that absorbs storm water and filters it into the ground, rather than allowing it to make its way into the sewer system. The 508-square-foot alley was completed in September, but officials held a ribbon-cutting ceremony on Friday. During the ceremony, Walsh called Public Alley 543 a forward-looking way of tackling the problem. “This project’s important because it really is about the future of storm water and being able to capture storm water,” he said. The first was constructed in 2013 by the Boston Architectural College, in between the college’s buildings on Boylston and Newbury streets in Back Bay, in conjunction with the city. Construction of the alleys marks another step in efforts to boost the quality of water in the rivers that flow into the harbor of Boston. In 2012, the Boston Water and Sewer Commission had to pay a fine for violating the Clean Water Act and take measures to minimize pollutants going into the waters. The porous surfaces also help keep ground water at optimal levels in places such as the South End, where many buildings were constructed on top of wood pilings. If exposed to open air, those pilings can rot, which could lead to a collapsed building. 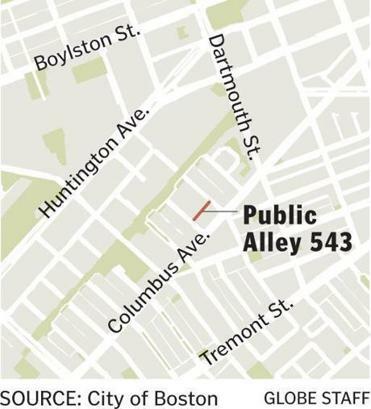 The Public Alley 543 project received a $298,000 grant from the Massachusetts Department of Environmental Protection, according to Pallavi Mande, the director of Blue Cities Initiative for the Charles River Watershed Association. Melina Schuler, a spokeswoman with the mayor’s office, said the city pitched in about $230,000. The Charles River Watershed Association approached the city about constructing another green alley about a year ago, according to executive director Robert Zimmerman Jr.
Zimmerman said such innovations are essential to help preserve bodies of water like the Charles River, but for many years, it has been difficult to garner support for constructing the porous alleys. “We’ve been paving things and building roads and stuff like that downtown for at least a century, and we get used to doing things in a certain manner, and to change that takes a while,” he said. But Zimmerman said city officials were open to the proposal and willing to help foot the bill. Thomas Ballastero, the director of the Stormwater Center at the University of New Hampshire, said such green infrastructure is becoming more common across the country. Chicago, Philadelphia, Los Angeles, and Baltimore are among the cities that have constructed alleyways with porous surfaces. “There’s this whole paradigm shift from ‘rain and drain’ that has governed us,” said Ballastero, who helped with the Boston initiative. Public Works Commissioner Michael Dennehy said the city will keep a close eye on the alley throughout the winter to see if they can use it as a “template” to replicate on a larger scale. Since the alley was first constructed, the Charles River Watershed Association and the Boston Groundwater Trust have been monitoring groundwater levels at the site. Christian Simonelli, the executive director of the Boston Groundwater Trust, said the groundwater has remained at optimal levels, which has kept the partners in the project optimistic. “We’re really looking forward to the benefits of this, and we really hope it works,” he said.